Get one of your big three items down to about 1kg to reduce the base weight of your pack. This trim cut bag is aimed at fast-and-light hikers and alpine climbers. With its insulation distributed primarily on the top side, it functions as an efficient bag for cold nights at altitude or winter excursions. Reflective seams trap warmth to aid in heat retention and hydrophobic down manages dampness to maintain warmth through mixed conditions and rainy nights. 800 fill-power Nikwax Hydrophobic Down is exceptionally warm and retains less moisture than traditional down. Zoned insulation puts more fill on top, as your sleeping pad provides insulation, there is less down on the bottom of this bag. Reflective ThermaCapture™ lining traps radiant body heat to provide additional warmth without adding grams. 2 stretchy SynergyLink™ connectors hold your mattress in place under the bag. Cinchable hood features a heat-trapping draft collar. Toe-asis™ shaped toe box features an interior baffled pocket of insulation to warm your feet. External zip pocket houses a headlamp or contact lenses. 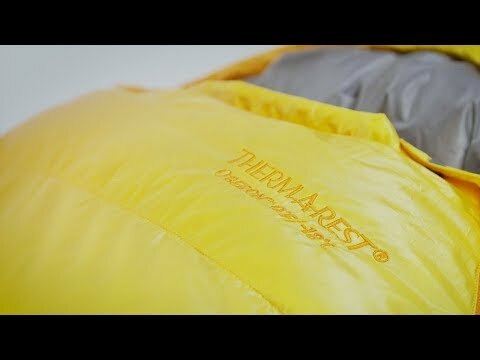 Quilt loops let you customize your sleep system by attaching a Therm-a-rest quilt or blanket over top to add even more warmth.